Today's featured designer is Sara of Sew Sweetness. Sara has 2 books: Big City Bags, and Windy City Bags. You can also find her on Craftsy, where she teaches all about the best interfacing for bagmaking. Her website offers patterns, tutorials, cork, glitter vinyl, faux leather, supply kits, hardware and her extensive blog. 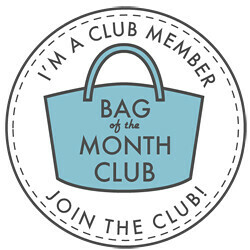 Sara is also a designer in the Bag of The Month Club. She's even designed a couple fabric collections! Sara's latest product, Sew Sweetness Videos, has just been launched and for a limited time you can purchase all 4 videos with patterns as a bundle, and save. I first learned to sew in the 3rd grade - my mom taught a friend and I how to sew. We made 2 projects, a draw string bag and a top - my mom let me wear mine to school (hers wouldn't). I didn't sew again until my youngest child was born. I needed something to do at night, both of my kids woke up every 2 hours as babies, and Netflix was getting real old. I love the flexibility - if my kids are home sick from school, I can be there for them. We've also been able to travel a little bit and see different places. This also comes with its challenges - because I am home all of the time, it's challenging juggling work and family when my kids are home during the summer. What is the hardest part of the design process for you? I really love all parts of the design process. While I'm not very attached to the finished bag, I completely love sketching out ideas, drafting pattern pieces, and writing instructions. Just so that I don't give myself too much of a pat on the back, drafting garment patterns is very challenging for me and an extremely slow process. Garments was one of my goals for this year, but it's always been such a huge struggle for me, I probably should just put it out of my head, lol! Reading books, watching tv shows with my husband. We just started watching The Americans, and we're hooked. My favorite books are historical novels and thrillers - my favorite authors are J.K. Rowling, Michael Robotham, Kate Morton, and Jodi Picoult. What is your favorite pizza topping? Just cheese - I'm a picky eater. Although I did have dinner with a friend in Portland once, and I stuck my neck out and had an onion and leek pizza which was amazing. I really love cutting out fabric and attaching interfacing - it's really soothing. Twist locks are beautiful and no matter how many I've put in, they still stress me out. I would say that the Cumberland Backpack is one of my favorites. I love using the small sized backpack over the summer when we're out riding bikes. I just made another one as part of my sewing videos, and I really love it. The Appaloosa Bag pattern is my favorite to teach - it seems like it fits a wide variety of tastes and people love the accordion on the front - plus it's something that most students can finish in a 7-hour class. I love the camera bag from the Serendipity Studio Meda Frenzy pattern booklet. I made one for my mom a few years ago for Christmas. It was a challenging sew but I felt pretty accomplished when I finished it. I don't always take good care of myself during the workday (mostly forgetting to eat or drink), so I order myself snacks from Graze and Nature Box. My favorite is the Sweet Mustard Ranch from Graze - it's a bag of poppyseed pretzels, honey mustard breadsticks, and sour cream cashews. Metal rectangles and sliders are so useful. I have a Juki TL-2010Q that I've had for a few years. It's a workhorse. I recently got the Juki QVP 2200 Mini (which is basically the same thing as the TL-2010Q) because I needed a second machine for our filming studio (it's more of a dark dungeon than a beautiful studio) in the basement. We're filming twice a week now, and I had a hard time carrying it up and down the stairs since my machine was all metal. Just keep sewing - sew a new project every week. You learn something from every project that you make. That someone used one of my patterns to make their first bag. I'm not particular about keeping things clean in my house in general, although it does ease my mind to be working in sewing room where I don't have clutter on the floor. I like watching episodes of Law & Order: SVU. I've gone through all of the seasons about 4 or 5 times. I don't know if it's because I have short term memory or what, but many of the episodes I don't ever recall watching (even though I must have). Go figure. I'm usually in my pajamas until about 2pm on workdays - my kids get out of school at 3pm, and I usually take a shower and get 'dressed for the day' at 2:00. How do you make sure that your patterns are accessible to bagineers? How do you promote your work? 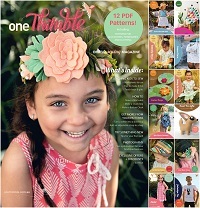 Most of my patterns are available in both pdf and paper pattern format. Many of them are also translated into German. I'll be debuting step videos on May 22 (now available)- I sew through an entire pattern in each video, which I hope will help those who are visual learners. I'm really excited about the videos - it was a challenge getting to this point but I'm really happy with how the visuals in the video look and I hope that people will agree that they are clear and easy to follow. Thanks for the great post. I enjoyed learning more about Sara. I would recommend her patterns to anyone. I have made the Rock Star bag and the Filigree Double Zip pouch, and the directions for both were great. I loved the results too. I've been wanting to try the Rock Star bag. I need to find time to do that!! I like learning about designers and their background. Very interesting. I've been a fan of Sara's work for a long time. Until recently I was scared to try her patterns. Mainly, lack of confidence and I'm more of a visual learner. I decided to jump right in and I ordered all three of her dies for the Sizzix, one of her books, and I'll be getting the videos! I'm excited to try Sara's patterns and to see what's coming next! I LOVE that Sara is in her PJ's until the afternoon, before her kids get home from school. I admire her creativity, her ambition, her savvy, her business sense - all that and yet she is so down to earth. Looking forward to seeing her new patterns. I recently bought one of Sarah's patterns. Love all of them. Sara, is inspirational. She has patterns for all ages. Easy to read, easy to follow and if you need help she is always there. Beautiful lady. Loving this series! It's so interesting getting to know a little more about each designer and how they got interested in bag making! This is a great series. Learning a lot about each designer!